It's hard to imagine moving abroad, especially for those who are relocating to another country from the Golden State. There a lot of steps and a long list to check off, however, the first step is finding a reputable overseas mover. As an international moving company, we know that every individual, family and company will have budgets set in place and specific needs, which is why we tailor our moving services to each clients international move. Whether you are moving an entire household worth of goods or simply a single bedroom or office, you'll be able to select the option that works best for your budget, size of move and final destination requirements. 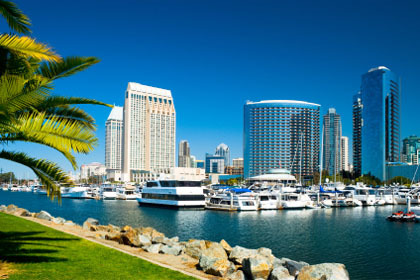 We operate from five offices across the United States and one overseas in the UK, but our company's headquarters and primary west coast operations are located in Los Angeles, from which we serve California's international relocation needs. As a full service international moving company, we will help move your home overseas from San Francisco just as easily as someone moving from LA. When using our services, you'll get exactly what you pay for...great service and affordable rates. Our quotes include a breakdown of the entire move and are all inclusive with no hidden costs. Furthermore, when using Schumacher Cargo as your international mover, you'll have the peace of mind knowing that we'll be the ones handling your personal effects since we're not a broker. Worried about whether we have services to your small city or town? Don't be. We've helped families move overseas from major cities in California as well as from smaller towns. The process of moving your goods and personal effects overseas from California is straightforward when you've been doing it for as long as we have. The steps are simple; after making a booking, we will provide in home packing of your personal effects, wrapping and transport to our location if using a door to door service. Those that are planning an international move from northern California, San Francisco or Sacramento could have the option of a direct transport to one of closer ports but in general, we will be shipping your household goods from our Southern California location. Once your shipment arrives at our warehouse, our team of international movers will make sure that everything is secured, issue a full inspection and inventory report and prepare the necessary documentation for US customs. The question depends on whether you are using your own container vs. shared, how soon we can get your household goods to our warehouse and the final destination. For example; someone who is moving to London from California can expect a longer transit time than someone moving to Australia. After we have received the shipping container, the amount of time it takes on the water can change at any time but generally for shipments heading to Europe from the port of LA, it roughly takes four weeks on the water. Moving cargo to Australia or New Zealand from California usually requires about three weeks. It's important to note that these figures should serve as guidelines rather than exact numbers. The same goes for assessing the costs of an international move from California. Since each shipment varies, by volume, destination and physical location, we don't offer a cookie cutter rate for overseas moves. The best way to find out an accurate amount is to contact one of our moving specialists at 800-599-0190 or fill out our quick quote form. Find out the cost of your move by requesting your FREE Moving Quote!